Thanks for your interest in Vessel Service Solutions. We'll be in touch shortly! 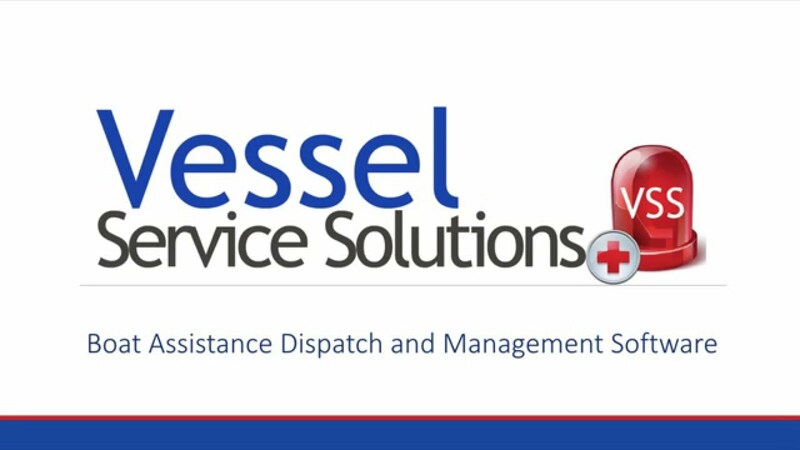 Vessel Service Solutions is a software program that imports BoatU.S. tow case emails into a standardized form. The case can be edited in VSS and dispatched to a specific captain. The captain then retrieves the case on an iOS device (iPad or iPhone). 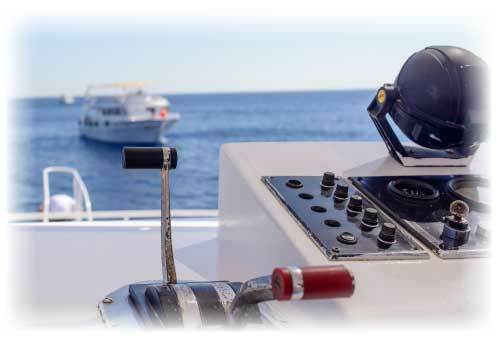 While the captain is assisting the boater, he can track his time on scene and time in tow, list services rendered during the call as well as obtain the customer signature - even if there is no internet service. Once the tow is complete and the captain is back in internet range, the case can be sent back to dispatch for final review and billing. 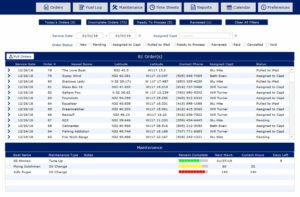 Dispatchers can review the completed case and quickly email it to BoatU.S. and the client. If you use QuickBooks for your accounting, you have the option to send the case to QuickBooks Desktop or QuickBooks Online as an invoice. 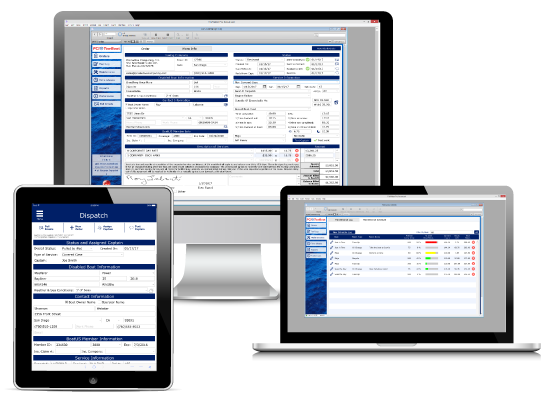 A paperless and efficient way to manage tow cases by quickly importing BoatU.S. case emails or creating new orders for non-member cases. 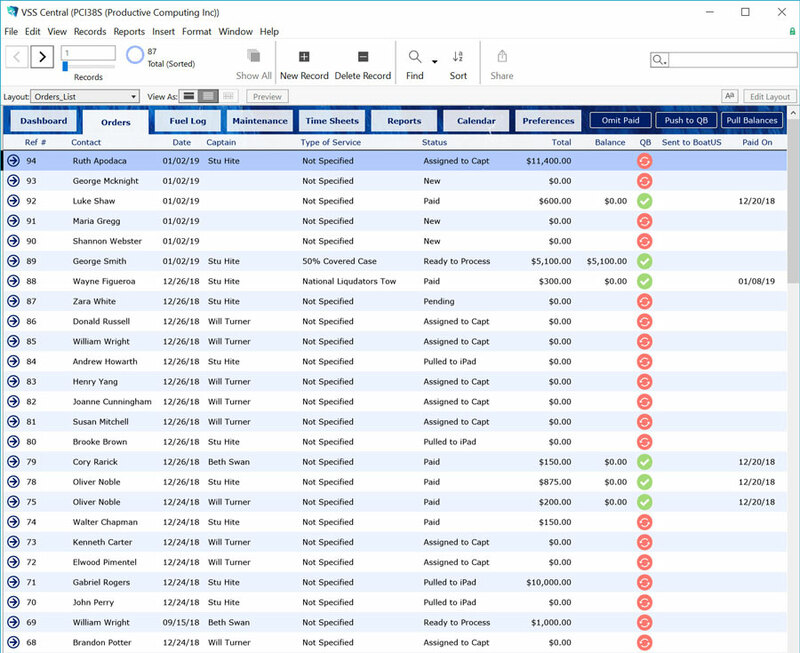 Speed up your accounting by connecting VSS with QuickBooks to track invoices and payments. 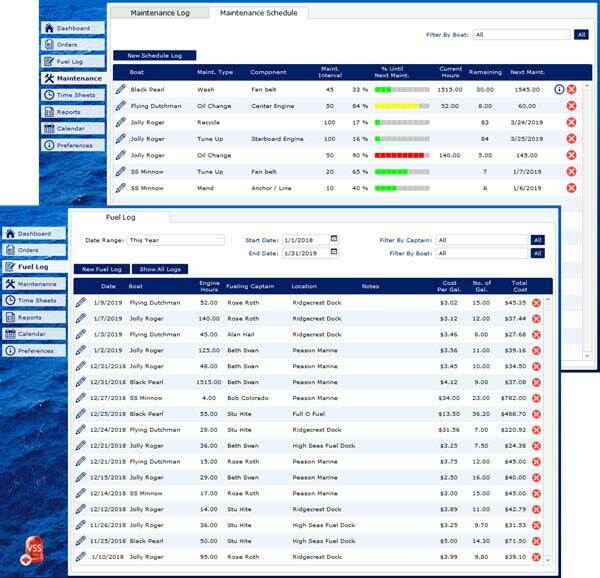 With VSS you can create maintenance schedules with alerts to track when boat maintenance is due and input fuel logs and maintenance logs to track boat costs and fuel efficiency. 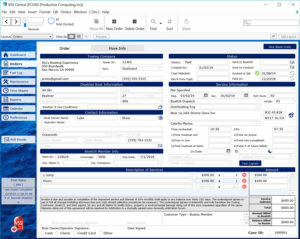 VSS includes thirteen standard reports for orders, boats, and timesheets with the ability to create unique reports based upon your tracking requirements and preferences. 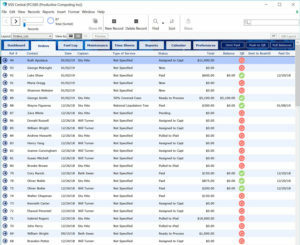 The Preferences module in VSS is only accessible by management and is the epicenter of control for the entire solution. 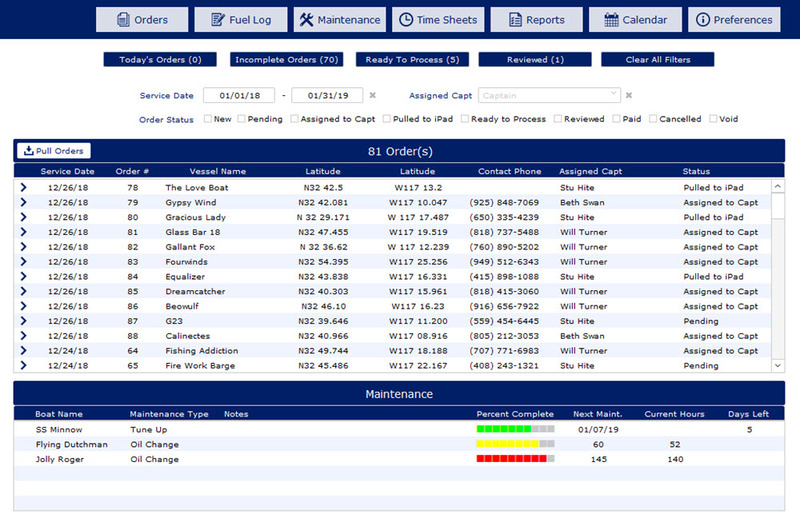 With a robust calendar, you can track future tow orders, staff vacations, or other relevant dates. 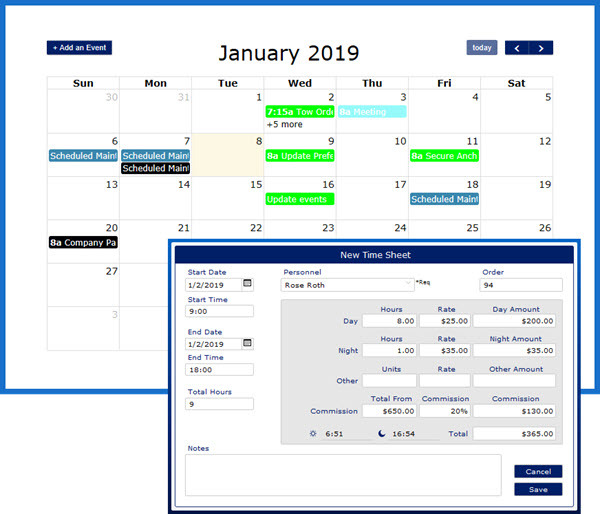 In the Timesheets module, captains and deckhands can record hours and cases worked and submit timesheets based upon day or night hours, per unit charges, or commissions. The VSS Setup Package gets you up and running with your new solution. 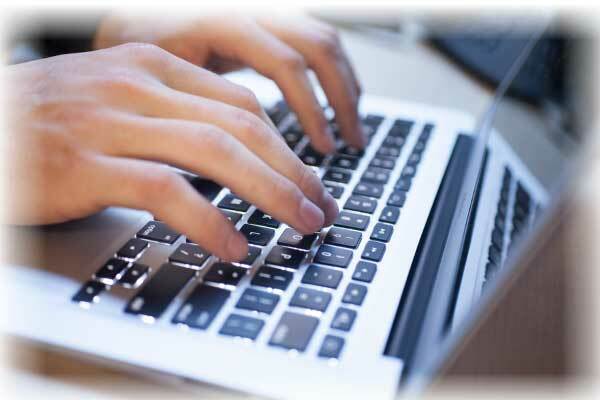 Our expert team ensures a seamless setup process. Getting started is easy! Get started with a one-time setup package of your VSS system and choose a subscription option. Setup includes onboarding meeting(s) conducted via screen-share on your computer. Our team will instruct you on how to use each module in the system and will review VSS on your desktop/laptop and your iOS device. Add additional boats to your fleet. Keep them active year round or place on hold during your off season. *Minimum subscription required year-round to maintain your VSS service. Customer credit cards will automatically be charged monthly or annually (depending on frequency selected) thereafter unless cancelled. All prepayments are nonrefundable. Ready to get started? Contact our Sales team. Added a server-side process that will continually keep Calendar events up to date on a per-minute basis, refreshing them with any changes made from their related Order or Maintenance Schedule. Added personnel-specific Commission rates under personnel preferences. 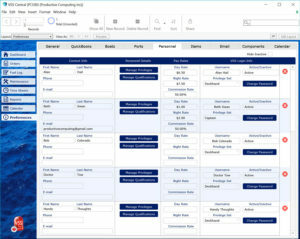 Commission rates will populate through to time sheets and orders for their linked personnel. Added a new module for managing Components. 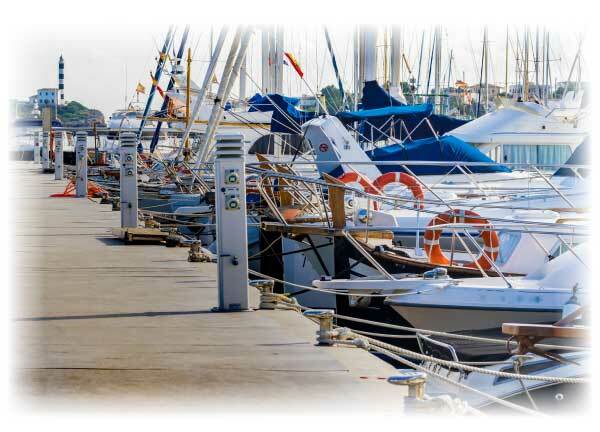 Components can be assigned to boats and can be treated as general inventory. Added a Qualifications section for personnel. Qualifications allow management to track the certificates and other qualifications that personnel have earned. 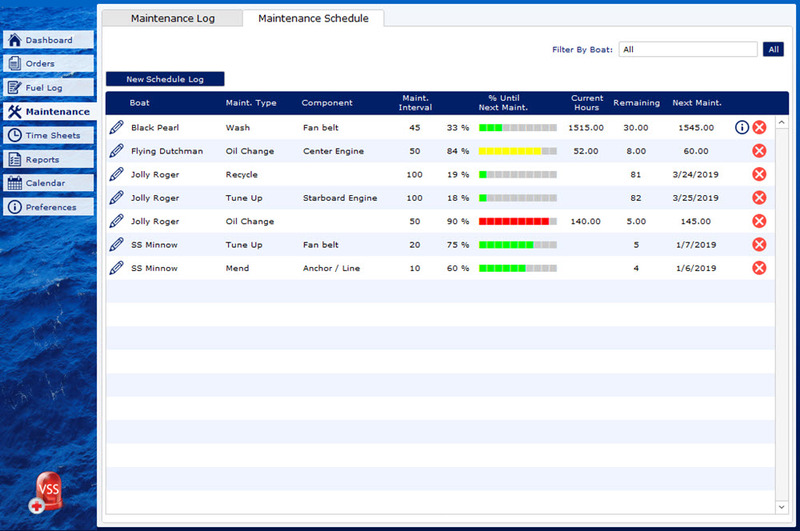 Added a new alert for Fuel Log entries that will prompt the user when a boat is due for maintenance. This will also send out an email and/or text alert to the personnel that have been designated in charge of handling maintenance alerts. Management can designate these “points of contact” from the personnel preferences section. Added a field for tracking boat battery level when refueling a boat. 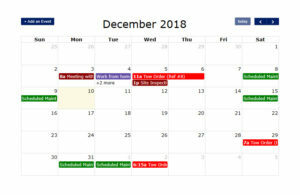 Added a new Calendar module. 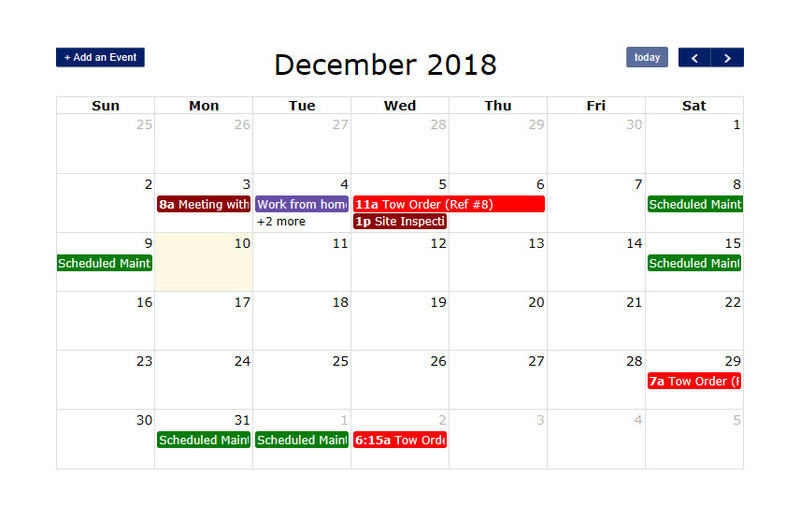 The Calendar module allows users to track events and tasks in an easy-to-manage interface, letting them manage events, track schedules, and view related orders or scheduled maintenance tasks. 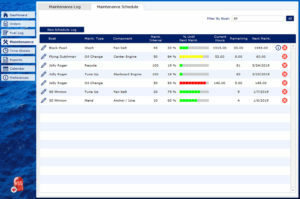 Added a report for unpaid time sheets. Resolved issue where invalid characters were acceptable for user account names. Resolved issue where some personnel dropdown lists were still displaying inactive personnel. Resolved an issue where some inactive boat information may show up in reports with active boat information. Updated the process of duplicating an order to ensure orders are properly duplicated and prepared for new data. Added support for 24+ hour span on Orders. Orders will now properly calculate amounts for cases that span more than 1 day. Added support for 24+ hour span on Time Sheets. Added the ability to specify whether to send emails via an Email Client or via SMTP in the Preferences section. Updated the FM Books Connector Online batch scripting to resolve an issue where incomplete messages were being returned on error. 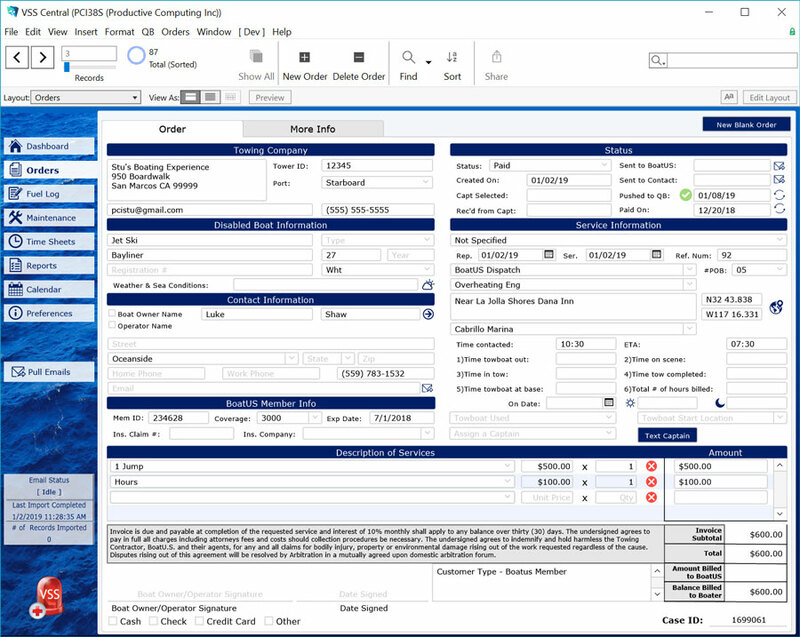 Updated the FM Books Connector and FM Books Connector Online invoice push processes to provide appropriate error messages when pushing line items that are missing valid items. Updated the FM Books Connector Online batch scripting to resolve an issue where a background window used in the process was not properly closing. Added additional order statuses to the Orders system: Pending, Canceled, and Void. Updated stored plug-ins to their latest versions: FM Books Connector version 11.0.0.1, FM Books Connector Online version 2.0.5.0. Improve connection reliability between the Remote file and the Central file. Solved an issue in the Maintenance Schedules where the scripting was not properly halting when validation fails so it ends up saving the schedule without complete information. Added error messages to catch for record locking when pulling orders and submitting orders. VSS is now accessible on iPhones using FileMaker Go. Added an error message to the remote file with instructions on how to resolve a "connection lost" issue. Productive Computing’s support staff works Monday through Friday, from 8:00 AM to 5:00 PM (Pacific Time) and are available during these hours to address questions and issues. Occasionally, you may need to leave a message and we'll get the request done the same business day or by the next business day. For VSS emergencies outside of normal business hours, please call 760-510-1200 and you will be forwarded to an on-call team member. There may be a delayed response, but we will troubleshoot the system and respond as soon as possible. © 2018 Productive Computing, Inc. All Rights Reserved. 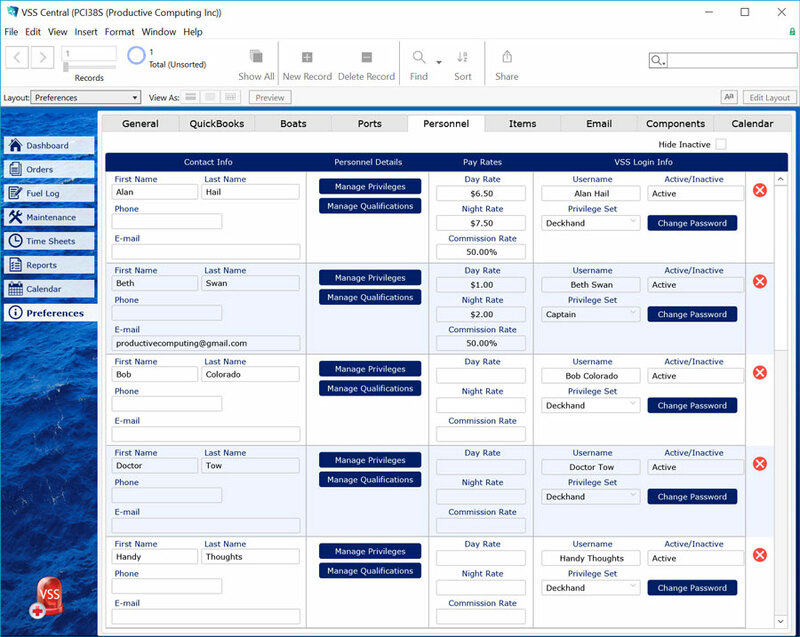 Productive Computing, Inc. is an independent entity and this website has not been authorized, sponsored, or otherwise affiliated with FileMaker, Inc. FileMaker is a trademark of FileMaker, Inc., registered in the U.S. and other countries.